List of knitting cast on methods I compiled. According to Wikipedia, “casting on is a family of techniques for adding new stitches that do not depend on earlier stitches“. When I first learned to knit, I only know one way to cast on stitches. Now I know better. Different cast on methods offers different effects. I tried to be as comprehensive as possible with this compilation. If I missed any, do let me know. There is no better way to learn knitting than to watch someone demonstrates it, so I have included as many how-to videos as I can, selecting those I think are really clear. Wrap Cast On is also called the E-wrap or Loop or Thumb Cast On. Essentially it is like making an E with the yarn and looping it onto the knitting needle. This should be the easiest casting on method although it is not popular among knitters. There are a few reasons for it. Knitting the first row might prove a tad challenging for new knitters who find handling the knitting needles and yarn fiddly. Maintaining tension is also challenging. The Long Tail Cast On is a more stable method then the Wrap Cast On. It produces a very nice and firm edge too. There are 2 ways to do the Long Tail Cast On method: the Sling Shot and the Thumb Long Tail. I remember I have a lot of trouble figuring out the Slingshot Long Tail because of the positioning of the thumb and forefinger, all the twisting, and picking up yarn. If you are like me, then you may want to try the Thumb Long Tail first. This thumb method is great for knitters who like to hold their working yarn in their right hand (like me). Although I like the Thumb Long Tail method, it is still worthwhile to learn the Slingshot because it is quicker. Long tail Cast On, I believe, is by far the most popular casting on method because the edge is beautiful and it is really quick once you get the hang of it. The only drawback of the Long Tail Cast On is you need to leave a long enough tail end. If you are casting on a few hundred stitches, you will need to either take time to calculate the yarn you need or be willing to waste some yarn. There are ways to calculate how much yarn you need to leave for your long tail. Basically 3.5 times the length of your cast on edge (the problem is, most times, we don’t know what is the length of the cast on edge). The German Twisted Cast On is also known as the Old Norwegian Cast On. This is a variation of the Long Tail Cast On that give the edge an elastic and flexible edge. It is great for edges of socks, mittens and any project that has a cuff. It is important that you are comfortable with the Long Tail Cast On before attempting this one. 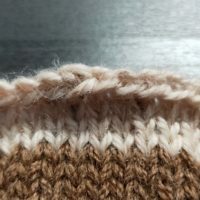 Beginners might feel frustrated with this but if you are planning to make lots of socks, mittens, hats, and gloves, I feel this is an important technique to master. Another variation of the Long Tail Cast On. Like the German Twisted Cast On, it seems to be designed to cater for stretch. The right and wrong sides look similar so it is great for ribbing or reversible projects. I personally think this is easier than the German Twisted Cast on. What do you think? If you already know how to do a knit stitch, then you can do this knit cast on. I was told that the beautiful Estonian lace shawls use this cast on. It is not my personal favourite because it leaves little holes in the cast on edge and a little channel on the wrong side. To me, that is not a very pretty or neat edge. I discovered that if you knit the first row of a Knit Cast On using the Knit Through the Back method, the little holes disappear. Knowing how to do a knit through the back stitch means this cast on method is not for beginners. Many knitters will say that the Knit Cast On is necessary for casting on in the middle of the project. It is true although the Wrap Cast On and the Cable Cast On can do the same thing too. Find written and illustrated instructions at quinceandco’s blog. The name Cable Cast On is a little misleading because this cast on has nothing to do with cables. It is sometimes mistakenly used interchangeably with the knitted cast on but they are two different methods. The cast on edge is really neat and sturdy. This is my go-to cast on for the longest time because it gives me a sturdy neat edge without excessive curling. And unlike the Long Tail Cast On, it does not require a long tail. Save me some yarn especially the expensive ones. The Chinese Waitress Cast On produces a thinner and looser edge but still neat. There are 2 ways to do the Chinese Waitress Cast On. One requires 2 needles and the other a crochet hook. I find the crochet hook method more fluid. If you can crochet, this is a better way to do this cast on method. This cast on creates a sweet picot edge. I have seen this done on a little girl’s cardigan. This is not the only way to do a picot cast on but I find it makes a much nicer picot than some of the other methods. The Rib Cable Cast On is a method for ribbing. It is a little clumsy in my opinion but the effect is quite good. It is basically a variation of the Cable Cast On. Also known as the Alternating Cable Cast On or Invisible Cast On. The video explains how to identify which cast on stitch is the knit and which is the purl stitch. This is cool because when I tried the method myself, I couldn’t tell. The Italian Cast On is also for ribbing. This is by far the prettiest rib edge I have come across. It is the best cast on for a ribbed beanie. It assumes you are proficient at the Slingshot Long Tail Cast On. Of all the long tail cast on variations, this is one of the more complicated ones. The Jeny’s Slip Knot Cast On method is designed by Jeny Staiman for a super-stretchy edge. It is apparently good for projects using cotton or linen yarns. Since these yarns have less elasticity than wool, a super-stretchy cast on compensates for that. The Two-Colour Cast On method is based on the Long Tail Cast On. You must be very comfortable with Long Tail Cast On before attempting this one. It is great for double knitting and brioche knitting, although most brioche knitting instructions include a normal cast on and a set-up row to introduce the second colour. A provisional cast on method creates live stitches. Some patterns call for it so it is good to learn how to do it. There are a few different ways to do this. One of the most popular is using a crochet chain. The video below explains this method quite well, especially highlighting that you need to pick up stitches from the purl bumps of the crochet chain, which I didn’t know about. 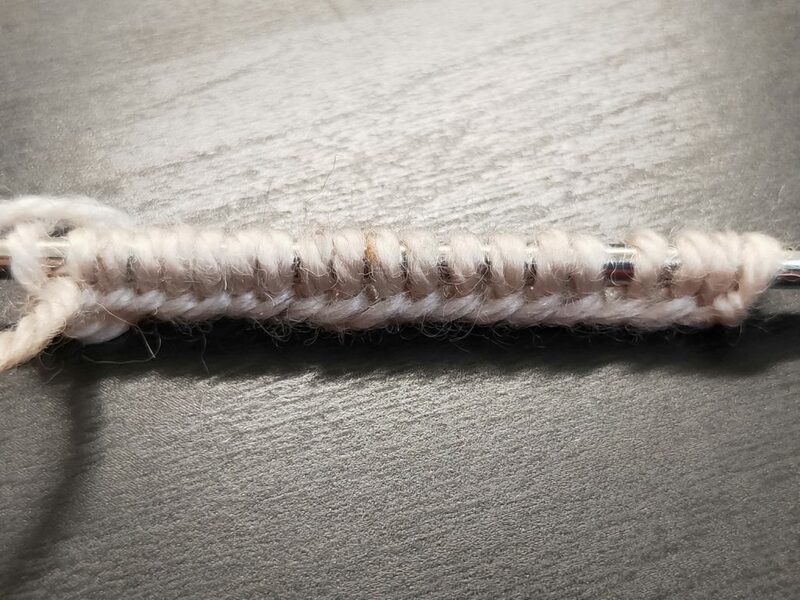 Verypinkknits offers another way to use the crochet hook to make the Provisional Cast On and I’m liking this method more. See it for yourself. If you don’t have a crochet hook or you don’t like it, you can learn how to do the Provisional Cast On without it. The Long Tail method for Provisional Cast On uses waste or scrap yarn. The videos available for this method are not very good. This one, I think, is the clearest. This last video presents 3 ways to do the Provisional Cast On without crochet hook. Judy’s Magic Cast On is really popular. It creates a stable and invisible cast on that is hard to beat. Sock knitters rave about it. If you intend to learn to knit toe-up socks, this technique is indispensable. When I first came across the Turkish Cast On, I realized that I may never need to seam or graft the bottom of any bag or pouch I make. It is really so simple although you will need to have circular needles. The Circular Cast On method is also known as the Pinhole Cast On. It is a good way to start a piece of knitting from the centre. It looks like stitches grow evenly out from the centre of the cast on. This type of cast on is easily achieved in crochet but is rare in knitting. The method invented by Emily Ocker needed the crochet hook. I am left-handed and hold my crochet hook in my left hand. I just cannot use this method. So, I am pretty stoked when I came across written instructions and illustrations of the Pinhole Cast On at tincanknits using only knitting needles. And a video tutorial by Suzanne Bryan. The I-cord Cast On method is, in my opinion, an advanced technique. You will need to know how to do i-cord as well as a provisional cast on. However, it makes a super neat edge that is reversible. In this video, the knitter was setting up to knit a project with i-cord row edges all around. Was I too ambitious when I decided that I wanted to compile a comprehensive list of knitting cast on methods? This is a mega list and I learnt a lot about the nuances and difference between different cast on methods. Some are really about personal preferences, but some methods do add polish and pretty effects to our projects. Looking for cast off techniques? 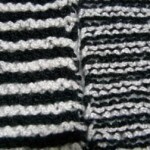 Visit my post on cast off / bind off.